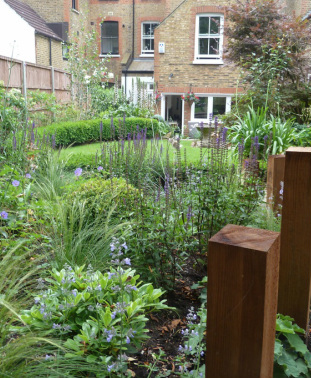 The owners were seeking to update and improve the design of their garden, with practical solutions for difficult areas, and a planting scheme that would be attractive to birds and insects. The back of the garden had become a storage area and needed to be linked to the rest of the garden. Upright wooden posts were used to create informal paths through the garden and to add a contemporary twist.